How do I buy produce? 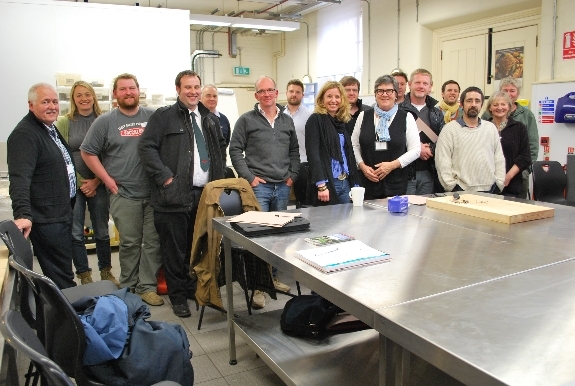 On Tuesday I made an ambling journey from Charcutier HQ to the School of Artisan Food in Nottinghamshire. With the rising cost of diesel I had to make the journey worthwhile so I planned some stops en route. First up was a visit to Amgen Renewables in Crosshands to take a look at their solar systems. I’d encourage anyone who has a suitable site and the means to install a system to do so – we’re considering solar, less for the financial return (thanks to the Feed-In-Tariff) more so as a way of future proofing the farm to the rise in fuel and energy costs. Second stop was G & T Evans in Newtown. We’ve needed to replace an agricultural shed on the farm for quite some time and the obvious choice for me is a Romney Shed. They’re a design classic, simply engineered and easy to erect – they even come as a flat-pack! 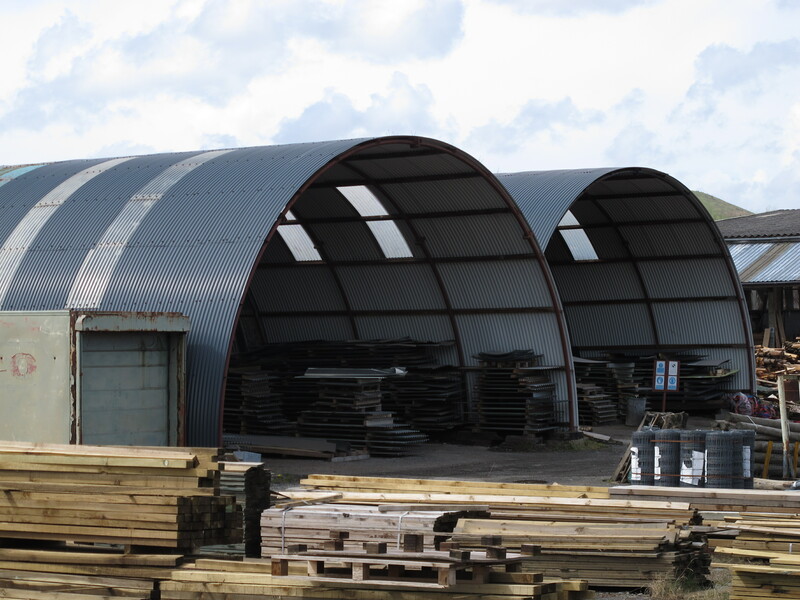 These two beauties have stood since the 1940’s and all the sheds produced are based on the original Ministry of Defence designs. Third stop was the Ludlow Food Centre, a really interesting development – a mix of food production centre and farm shop. In the shop you can take a peep through glass walls into the bakery, butchery, kitchen and dairy to see a raft of products being made. I bought a delicious picnic of goods to take away with me. Finally I got to Worksop, my home for the night ready for Charcuter-ish, a gathering of British Charcuterie producers the following day. I’m hugely grateful for the invite by Kate Hill from the School of Artisan Food, as I was most definitely the smallest company there. Having worked in small niche industries before, it’s always good meeting with other people from within the wider industry. It’s an opportunity to discuss your problems with others, and generally, you’re not alone, the issues that relate to you as a business are generally the same ones that affect everyone else. A problem shared is a problem halved. I’ve nabbed this group photo from Kate’s blog post about the meeting. I think it’s fair to say that every person at the event had his own view on what ‘charcuterie’ encompasses. I think of charcuterie as being a very broad church. However, to the majority charcuterie really concentrates on either cooked or ready to eat air dried meat. In the past I’ve used the definitions from Jane Grigson’s Charcuterie and French Pork Cookery to define the breadths of charcuterie, and, whether that’s correct or not; it encapsulates all pork butchery, and includes raw produce as well as cooked and air dried. Sadly, there isn’t a British term that encapsulates all this produce, and that’s largely why I called my own company Charcutier. The British Isles has such a rich history of pork butchery; we need to retain those methods and recipes in order to secure these traditions for future generations. In a sense all the producers sat around the table were ‘competitors’, and I use that in the loosest term possible as a man and van enterprise like myself shares very little of the same marketplace. Ultimately each business was selling British Charcuterie. However, each company differed greatly, they each had their own ethos, their own story, history and the produce on show varied greatly. One of the highlights of the day for me was the chance to taste products by the various companies. As I’m not yet licensed to sell my air dried produce I hadn’t brought anything along with me. In hindsight, what I should have done was to bring what I think of as ‘proper Welsh bacon’ and air dried Carmarthenshire Ham – produce that I make every autumn for our own consumption – a product that we’ve made as a family for centuries. I get a nervous twitch whenever I hear anyone say that we don’t have a history or tradition of air drying in the UK – we do, and it’s alive, though only in small pockets in rural communities. The production of our family traditional ham is near identical to a Parma ham – a primary salting, secondary salting, ageing and maturing. The big difference? The way it’s consumed: we slice a thick fatty chunk of three month old belly and fry it, or cut a piece of nine month aged ham and boil it. These were the basic methods of providing fresh meat prior to refrigeration. This tradition of preservation is still prevalent elsewhere. Joel Wright of Wrights Independent Food Emporium sent me this video recently, it’s far more eloquent than my ramblings. The purpose of Charcuter-ish was bring to together producers, to look at the possibility of working together, and it’s a very worthwhile goal. I think we had a very successful day, and I’m looking forward to the next meeting. It was hugely valuable for me, it reaffirmed my own ethos of producing modern British charcuterie which has its roots in the traditional, but it also made me realise quite how important it is that I carry on producing regional products so that they too can live on. This entry was posted in Charcuterie by charcutierltd. Bookmark the permalink. Fantastic – it’s so good to see British food being made and promoted. It can stand alongside the great cuisines of the world.